78-year-old Rosemary Otto is a self-taught, outsider artist whose work is both a form of creative expression and has helped in her recovery from mental illness. Rosemary Otto recently met up with Jana Panarites and Rolando Chang Barrero at her cozy and welcoming home in Lake Worth to discuss her life and her art-especially her newest series of painting "The Invisible Women." 78-year-old Rosemary Otto is a self-taught, outsider artist whose work is both a form of creative expression and has helped in her recovery from mental illness. 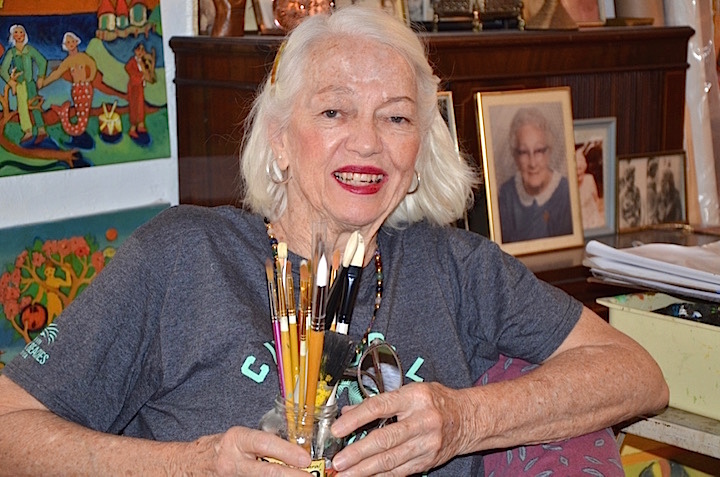 Born in Germany to an American mother and German father, Rosemary now lives in the house where she was raised: her great-grandmother’s house in Lake Worth, Florida, where she paints in between visits to the nearby senior center and her doctor appointments. In today’s show, Rosemary talks about the box of crayons that sparked her interest in art as a child, her mother’s influence, how she manages from day to day and why living in a nursing home is worse than being in a mental hospital. She also tells us about her new series of paintings, “The Invisible Women,” which challenges us to think differently about the older adults around us.